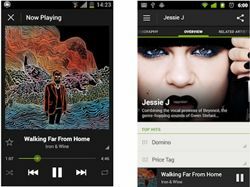 Spotify releases brand-new Android app; iPad app due soon | What Hi-Fi? Spotify has released a brand-new version of its Spotify for Android app. The app has had a complete design overhaul including full support for the latest Android 4.0 Ice Cream Sandwich operating system, as found on the HTC One X. As well as the "top-to-bottom redesign" there's a new slide-out navigation interface, more social features, allowing you to see your friends profile pages and playlists on the go. Artist imagery is now in high resolution and for the first time on any Spotify mobile app you can see related artists. Spotify is also promising the app for Android will also be much faster. More features are promised, including Last FM scrobbling, as available on the existing Android app and the Spotify iOS app, and folders. You can try a preview version of the Spotify for Android app now, before it goes live on Google Play, by downloading it from the Spotify Blog. • We're also hoping the long-awaited Spotify iPad app will soon make its way to the Apple App store. Our sister site Stuff.tv reports that development may be more advanced than the company's letting on.